There are plenty of question and answer website on the internet today and one of the greatest and largest would be Quora. This is not the only one; there are others like Stack Exchange and answers.com among others. Each of these sites serve a different purpose, as for Answer.com, you will realize that there are a lot of pithy questions and joke submissions. As for Quora, it has serious discussions on a variety of topics. When you look at stack exchange, it is primarily focused on development, programming and other technologically focused topics. When you choose to market on these websites, you need to look at questions your users need answers. When you provide these answers, you will be creating quality content that will bring you more users. This makes it clear that the Q&A will offer a good hub of possible traffic and information. In this post, we will discuss a couple of ways that you can use to leverage this for the best results. If you want to be successful in Quora, you need to speak from a point of authority. Anyone who is good at writing will come and give an answer but his does not mean that the answer is correct. The right way to do this is to write from a point of authority. Only answer questions that are in your area of expertise and support this by editing your profile to show how experienced you are in the area. When you want to get verified on Quora, it is similar to other social networks. You need to have a high profile so that users will benefit from knowing you are the person you claim to be. In this section, we will discuss some techniques that will work for you on Quora, as well as, other platforms. When setting an account with any of the traffic generating websites, it is required of you to put up an account. 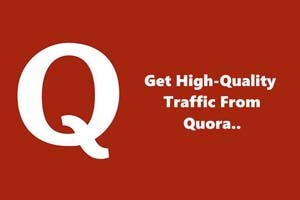 to make things even better for your traffic generation needs on Quora, we advise that you optimize your profile for traffic by adding a great bio, good profile summary and a headline. The other thing will be to have top tier answers when you’re writing one. You will not get a lot of traffic or recognition when you a tweet as response to a question unless the question asks for it. A good answer needs to have depth, tell a story and will sometime need to include an image. The beauty of Quora is that even if it has a good answer, there is always room to give an alternative and this will earn you more traffic for answering it. It is always good to acknowledge the first answer then offer your alternative.